This weekend it’s déjà vu all over again. From 9:45 PM Friday, January 18 to 5:00 AM Monday, January 21 there will be no Manhattan bound service at High Street, as A and C trains will be re-routed to the F line between Jay Street-MetroTech and West 4th Street. 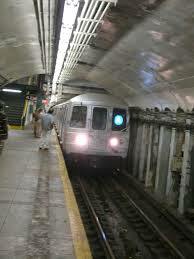 2, 3, 4, N, and R trains should be running normally. This re-routing will continue the following work week, each night, Tuesday, January 22 to Friday, January 25, from 10:30 PM to 5:00 AM. During these same hours, A train service from Jay Street to Utica Avenue will be replaced by free shuttle buses. From 11:45 PM Monday, January 21 to 5:00 AM Tuesday, January 22 there will be no service from Manhattan to York Street in DUMBO, as F trains will be re-routed to the A from 42nd Street in Manhattan to Jay Street. To get to Brooklyn from the LES stations on the F, take a Manhattan bound F to 4th Street and take a Brooklyn bound A or F there.